Submissive urination can be a problem for guardians, but keep in mind, that in dog language the dog is doing everything he can to convey the message “I am no threat." The problem usually disappears as dogs mature, gain confidence and become comfortable in their surroundings. It is very important that you DO NOT PUNISH the dog. Submissive urination is a separate issue from housetraining. NEVER CORRECT or PUNISH a dog that urinates submissively. Just avoid eye contact and ignore the dog. You need to help build the confidence of your dog. Go to your veterinarian to ensure there is not an underlying medical condition. Clean up the urine with a product designed to remove companion animal odors and stains, such as Simple Solution®. Ignore your dog while you are cleaning up the urine. Enroll your dog in an obedience class that utilizes positive reinforcement. Practice training for five to ten minutes each day. You can offer him cues that he knows during times when he is likely to submissively urinate. When he responds correctly you can reward him. This will give him something to do besides urinate and will help build his confidence. Vigorously exercise your dog for at least fifteen minutes twice a day. Avoid long affectionate departures and arrivals. When arriving home acknowledge your dog with a soft hello. Then avoid eye contact and ignore the dog for the next 15 minutes. When you and your dog are calm, get down on the dog’s level and softly call the dog to you. Let your dog approach you. Avoid approaching him with postures that he reads as dominant. Avoid direct eye contact. Look at his back or tail. Pet under the chin instead of on top of the head. Present the side of your body rather than your full front. Ask guests to ignore the dog when they first enter your home. 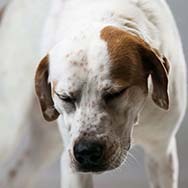 After they have been in the home for a short period of time, they may greet the dog in the same manner described above.